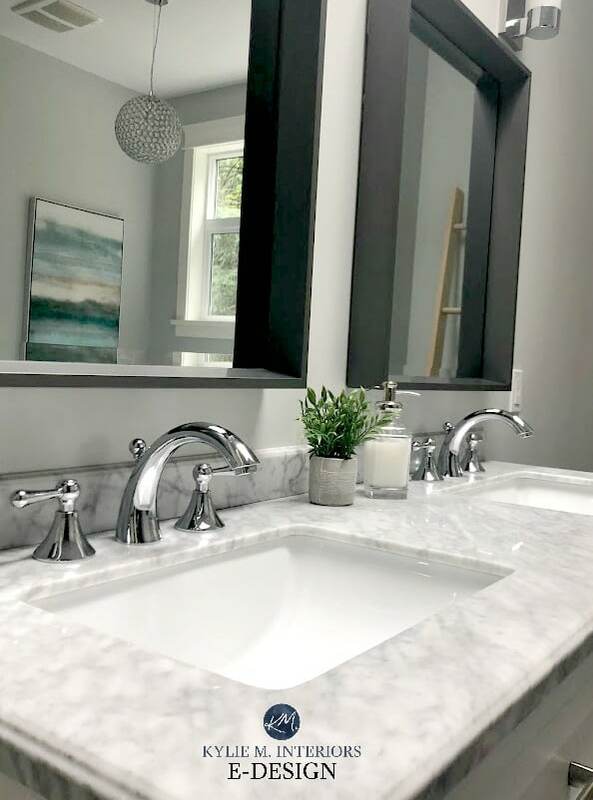 You are here: Home / My Projects / New and Whole Home Design / A Modern Farmhouse Style Home: Paint Colours and More! While my E-design keeps me hopping, once in a while I’ll take on a local project just to get out of Tim’s hair (what’s left of it, mwahaha). And this is a project that I actually finished a few years ago, but since the owners are now thinking of selling, I decided to get in and take a few photos while I had the chance – and hot DAMN, do I love this house! Let’s start with the outside. Because it was new construction, I obviously don’t have before photos – unless you want to see 2 acres of trees and bushes – whoopie ding, right? It was a CRAZY sunny day when I took these photos, so it was hard to capture how beautiful the colours and curb appeal of this house are. We went with Benjamin Moore Rockport Gray, one of my fave greige paint colours and Cloud White trim. 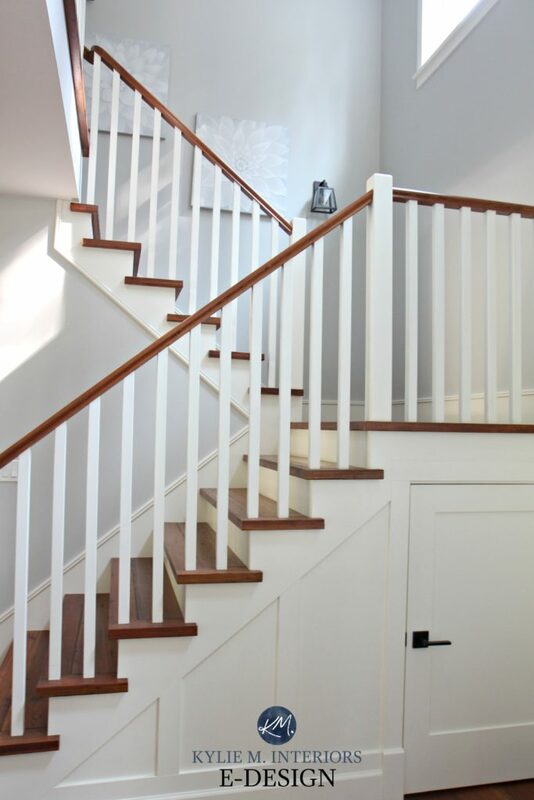 Step in the front door and you’ll see a gorgeous staircase and reclaimed solid wood flooring from Antique Impressions. 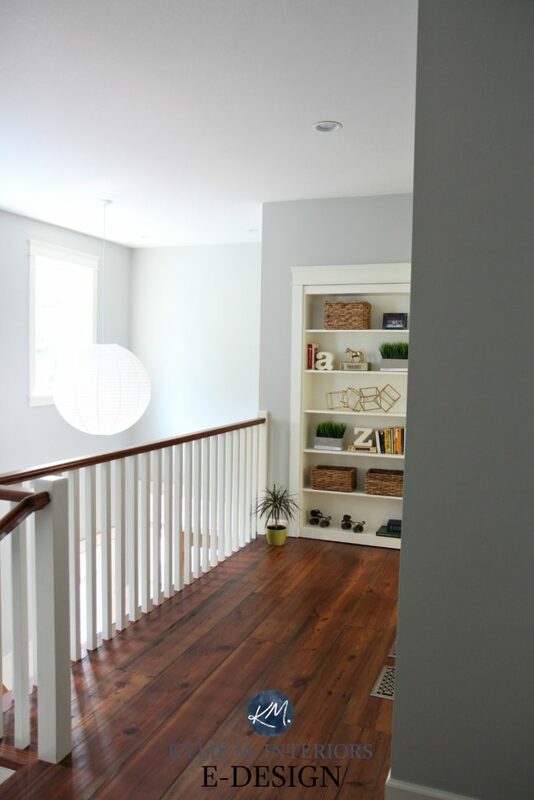 We went with Benjamin Moore Gray Owl for the main hallways, entryway and stairwell. And if you look to the bottom left of this next photo, you’ll see my puddle of drool…yes, this house made me drool (but I blamed it on the dog). 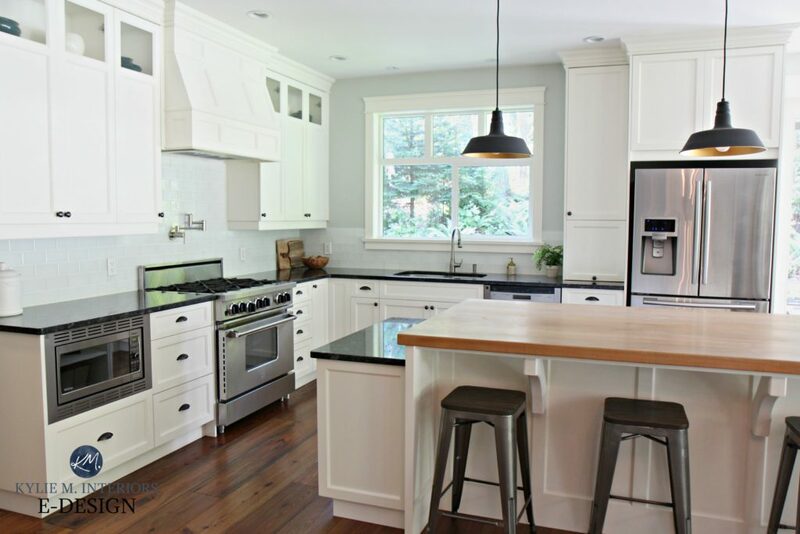 Black granite and butcher block countertops were partnered with Cloud White cabinets for a high contrast, but subtle country vibe. The paint colour on the walls is Benjamin Moore Gray Cashmere. Obviously, I’m not a pro photographer, so I couldn’t quite capture EVERY awesome moment of this house, so I’ve tried to focus in on the areas that are the most amazing (soooo, pretty much everywhere). Seriously, look at this friggin’ fireplace. My client got some old wood, whitewashed it and applied it to the fireplace surround (he’s not just good lookin’ you know). Oh and the fireplace insert? LOOK AT IT! It is THE most gorgeous wood burning fireplace…evah. Love how the glass front slides up, so you can have an open fire or a closed one! And guess what? There’s ANOTHER awesome fireplace. This one got a more industrial application as it’s in my client’s home office. We went with a palette of Benjamin Moore Kendall Charcoal and Navajo White to set off the faux metallic surround. This fireplace is see-thru and because I’m not the best photographer, I couldn’t get a decent shot of the one on the other side (which is again, different from the one in the living room). Now, here’s where I’m going to blow your mind. You ready? Okay, deep breath – WHERE’S MY WINE! On to the master bedroom and ensuite bathroom. 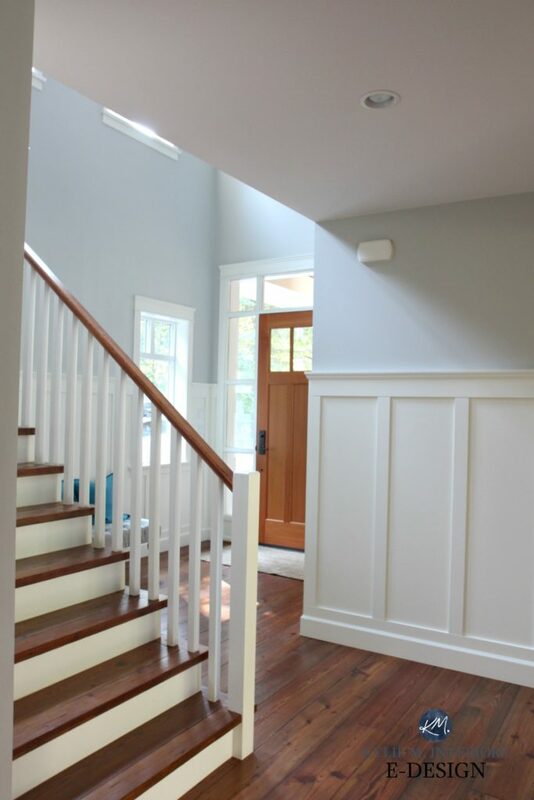 We used Benjamin Moore Revere Pewter in the master, along with Cloud White trim. With the reclaimed wood and blush accents, it gives a super rustic romantic vibe. 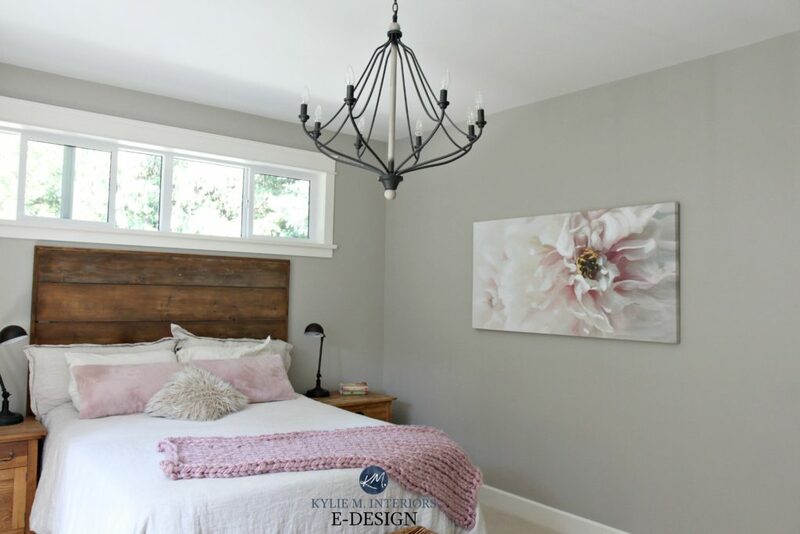 The paint colour is Benjamin Moore Wickham Gray, a gorgeous gray with blue-green undertones. And check out the pebbles under the freestanding tub, giving it a relaxing spa-vibe. The same pebbles were used in the shower base (no photo, sorry). Their daughter wanted a purple room, so we went with the lover-ly, Benjamin Moore Lily Lavender, which is beautiful with gray and white accents. Their teenaged son wanted a more studly colour, we went into the blue world with Benjamin Moore Colorado Gray. Chicks dig it. The paint colour is Benjamin Moore Ocean Air, one of my fave blue paint colours. Seriously though. Hunter the dog had some serious help from the owners, Scott and Erin Allen of Millhouse Projects, who not only created the AWESOME floorplan of their custom home but also helped build it themselves, including those FABulous fireplaces – they put a heck of a lot of heart in this home. So, there you have it! And it’s for sale, so if you’re on Vancouver Island or looking to move to the most BEAUTIFUL place in the world, you should check it out! 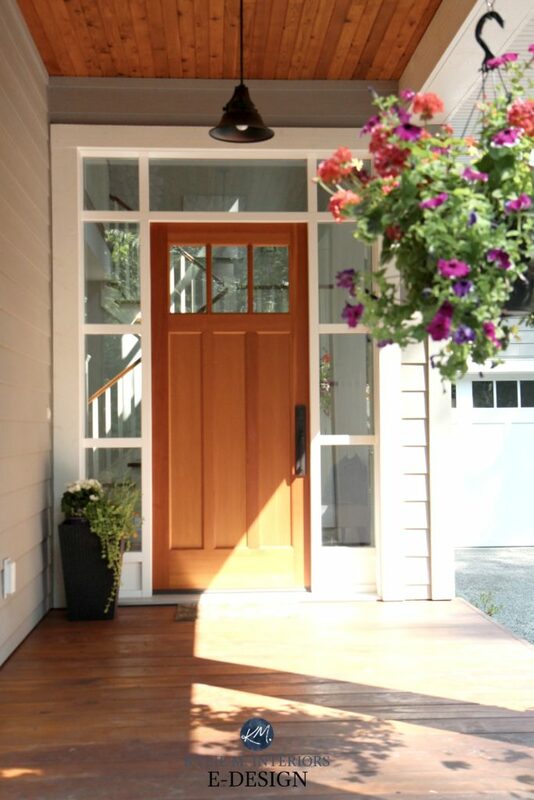 NEED HELP WITH YOUR OWN HOME? CHECK OUT MY AFFORDABLE AND FUN E-DESIGN AND E-DECOR! Such beautiful color choices! I’m saving this post!! Lovely home. Huge fan of Grey Owl although I settled on SW Accessible Beige for my north facing home. But honestly, I think you found a little gem with your new house and it’s lovely views.